There is no need to worry about what to wear on your first lesson, as no riding school will expect a complete beginner to have all of the right clothes and they will have plenty of essentials there for you to borrow. But it is important to have a rough idea of what riders wear, and also to wear safe and comfortable clothing. Comply with what the school asks – they may have certain requirements for you when you book your lesson, and this is always for your own safety. 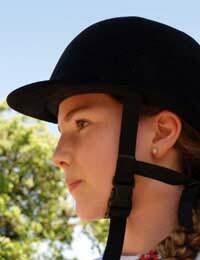 The one thing you must wear – over which there is absolutely no negotiating – is a riding hat. There is no compromise over this and this is the one thing that you should think about buying for your first lesson as it is always best to have your own. Riding hats comply with a British standard system and the various regulatory bodies of riding will approve certain standards at any one time. Even if you do not ride for long, a riding hat is a worthwhile investment as it could literally save your life. If you really cannot buy your own then you will have to borrow from a school. The school will have lots of different sizes so always make sure the one you are using fits correctly. Never make do. If you think the hat you choose has been involved in a collision, do not use it – it is always better to be safe than sorry. Proper riding boots are best, of course. But it is unlikely you will want to and unrealistic to buy them for one lesson in case you do not take up riding properly. So, when getting ready for your lesson, pay careful attention to your shoes. Trainers are ok – not perfect but ok, although ideally you need something with a small heel to stop the foot slipping through the stirrup. Trainers are usually ok for beginners because of the grip, but never wear anything like hiking boots – these are too grippy and may cause your foot to get stuck. Shorts are not suitable as they could hurt and chafe your legs. Jeans aren’t the best idea either because they will be heavy and uncomfortable if they get wet and can become stiff. Choose something which like jeans, will not tear easily, but are more lightweight. A comfortable top should allow your arms to move freely without fear of getting them trapped. If you are wearing gloves, they should be riding gloves so that your hands do not slip on the reins. Clothing when riding is important for a reason. Horse riding regulations are usually very strict about it. As you become a more advanced rider, clothing is regulated for appearances too. But as a beginner it is all about safety and comfort and these are two very good reasons why you should always abide by what you are asked to wear. I am a beginner and I was wondering what are the best joppers , gloves .etc. that I could buy could you help me.